Rarely a day goes by these days without numerous crowd funding projects commencing campaigns to achieve their targets. Most of them have not really been my thing, and I have yet to pledge backing to any projects as of writing this post. Today I have stumbled upon an app that has been in development for the past year or so which is seeking funding on Kickstarter. Development has progressed over this time on the Android version of CoffeeNotes, with a funding target of $20,000 required by August 8, with $570.00 so far pledged. Somewhat tantalisingly, as an iPhone user, the iOS version will be developed after the Android version, when the somewhat ambitious stretch goal of $80000 is reached. I am not sure what happens if the Android funding goal is reached and the iOS not, however perhaps this may change once the app is in (Android) use. CoffeeNotes performs coffee analysis on a smartphone so you can brew that perfect cup of coffee and share your recipes with the world. Never before has it been possible to perform coffee grind analysis on a mobile device equipped with a camera. 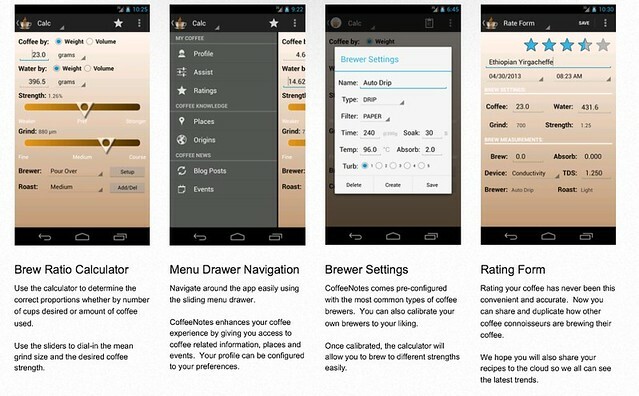 Part of the sharing features of the app will involve an open API to allow cloud based data collection and analysis for more accurate brew modelling. The unique feature involves analysis of your grind through a photo taken by the smartphone camera. This is best explained in the summary video on the CoffeeNotes site. On the balance of things, this is something I will support once I decide on which level to pledge. Should you back this too? That is a question only you can answer, however it is worth a look (with a nice summary video) if you are enthusiastic about your coffee.